Diameter Gauge and an enlarged 240mm long Millimeter Scale are the final three devices on the gauge. The grill points in the Grill Pattern Gauge have been lightened, to allow users to better see through the gauge. This new gauge also features improved lamination that will keep the printed image from scratching off, and prevent shrinkage due to age and temperature. It is a revised edition and quantity dealer inquiries are welcome. Includes a protective slipcover shown and a colored "contrasting backround card" to aid in measurements. The back of the slip cover has a summary of the instructions and feature description shown below. You can also download a PDF instruction sheet here. The slipcover is made from glossy 90 lb. card stock. The multigauge itself is made of durable hydraulically laminated clear TVC ANSI-X35d spec temperature stable plastic and measures 10.4 x 3.9 inches and is 0.0095 inches (9mils) thick. 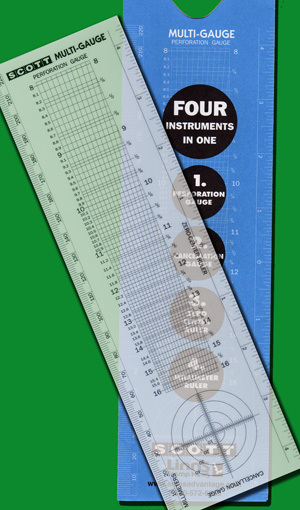 The tool you need to measure perforations in your stamps and much more. You will find many stamps look identical, but its the perforation, image size, and/or girll mark size that identify exactly what stamp you have. The tools below are perfect for just that. Don't start grading or selling your collection without one. The Scott / Linns Multi-Gauge is a perforation gauge, cancellation gauge, zero-center ruler and millimeter ruler in one user-friendly instrument. It is also great for measuring multiples and stamps on cover! This gauge is a clear plastic film. for measuring perforation, even on envelopes. Made of pressed alumimum. Here is Showgard's 2-in-one Perforation gauge. One side features a perf gauge with ruler markings on sides. The back is a SHOWGARD MOUNT SIZING GUIDE.